Canada’s Waterton Lakes National Park in the province of Alberta borders along the northern edge of Glacier National Park. In 1932, the United States and Canada agreed to join these two national parks as a symbol of their longtime peace and friendship. In recognition of this historic agreement, the parks were officially designated as the Waterton-Glacier International Peace Park. The two countries do continue to administer the parks separately, and you will notice subtle differences in the experience at either park. The highlight of Waterton Lakes National Park is, fittingly, the Waterton Lakes, most notably, Upper Waterton Lake. The upper lake runs from north to south across the international border into Glacier National Park. Spectacular mountain ranges tower over the lake on either side. The Waterton townsite at the northern end of the lake is the park’s center of activities. 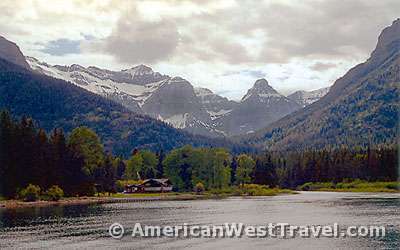 Boat cruises run from the town to Glacier National Park’s Goat Haunt at the lake’s southern end. This is the only way to access the Goat Haunt (except by hiking); there is no road access to this remote wilderness area. The boat cruise can be combined with hiking trips to shorten the distance of the hike. Most notable is the famous Crypt Lake Trail, considered by some to be the best hike in all of Canada. A 5.4 mile (one way) trail climbs into the mountains from the boat dock past waterfalls and through an enlarged natural tunnel in the cliff face to reach Crypt Lake in a hidden spectacular cirque. Many hikers take the cruise to the Goat Haunt where there is a network of excellent trails. There are several ranger-led hikes available during the summer. One outstanding ranger guided hike is the International Peace Park Hike. The hike starts at the Bertha Lake Trailhead in Waterton town and proceeds along the west side of Upper Waterton Lake across the border to Goat Haunt. Hikers then return to town via boat. The popular hike requires advance registration (available for the next scheduled hike only) at the St. Mary Visitor Center (406-732-7750) or the Waterton Lakes Visitor Centre (403-859-5133). Waterton Lakes offers several outstanding scenic drives. The Red Rock Parkway travels up the Blakiston Valley ending at Red Rock Canyon where there is a short nature trail. The valley consists largely of rolling grassland in an area where the “prairies meet the mountains”. Good wildlife viewing (plentiful deer near the campground) and good wildflower displays in late spring. The Akamina Parkway is winding mountain road which goes through Cameron Valley and ends at Cameron Lake, one of Waterton Lake’s gems. The lake has an interpretive exhibit, a trail on its west side, and boat rentals. Just north of Cameron Lake, the Akamina Pass Trail leaves the road heading west to British Columbia’s Akamina-Kishinena Provincial Park. This primitive wilderness is accessible only via this trail; there are no roads. The park features high alpine ridges, deep secluded valleys, windswept passes and is rich in wildlife, especially grizzly bear, big horn sheep, and mountain goats. It is an exceptional adventure for the hearty outdoor enthusiast. There are a number of easy hikes to beautiful sights from the Goat Haunt ranger station, near the boat dock. Please note that the mosquitoes are ferocious in the Goat Haunt area! Rainbow Falls. An easy and level one mile walk from the ranger station. Ranger-guided hike available. Kootenai Lakes. The lakes are 2.5 miles one way, with a 200 foot elevation gain. An excellent moose habitat with good viewing possibilities. Some of the trail goes through very moist, dense forest which is extremely buggy. Ranger-guided hike available. Goat Haunt Overlook. This tough trail is only one mile from Goat Haunt but climbs 800 feet. The payoff is a spectacular view of lake and mountains. Goat Haunt and Backcountry Customs Regulations. From the National Park Service brochure: People in tour boats and private boats arriving from Waterton Lakes National Park to Goat Haunt are not required to clear customs and immigration unless they travel beyond the immediate shore area of the Ranger Station. Those returning on the same boat will not be considered to be seeking admission into the United States. All hikers crossing the International Boundary from Canada are considered to be applying for admission to the United States, and are required to report to Park Rangers at Goat Haunt for inspection. Only citizens of Canada and citizens or Legal Resident Aliens of the United States of America, who have cleared customs and immigration at the Goat Haunt Ranger Station, will be allowed to travel into the United States beyond Goat Haunt. There are restrictions on all backcountry travel from the United States into Canada, within the Waterton-Glacier International Peace Park. For more information, please contact the Canada Customs and Revenue Agency in advance of any trip at (403) 653-3535. For specific requirements on crossing the border from the United States into Canada, call (250) 887-3413. For information on crossing from Canada into the United States, call (406) 889-3865. Waterton Townsite Campground. Mid-April to mid-October. Largest campground at Waterton Lakes with 238 sites, 95 with full RV hookups. Mostly open sites. Covered cooking shelters. Adjacent to the town of Waterton, within walking distance to restaurants, stores, and all travel services. It is also adjacent to Waterton Lake, convenient to the marina, beach, and numerous recreational activities. Reservations are available and recommended during the summer. Visit Park Canada's Campground Reservation Service or call 877-737-3783. Crandell. Mid-May to early September. Large campground with 129 sites accommodating tents, cars, and RVs. On Red Rock Parkway in the scenic Blakiston Creek Valley, about 5 miles west of Highway-5. Mostly wooded sites. Pretty mountain views. Easy access to many hiking trails. First-come, first-served; fills in early afternoon during summer. Belly River. Mid-May to mid-September. Small, primitive campground with 24 sites. Grassy sites in mixed aspen forest adjacent to river. On Highway-6, a few miles north of customs station. First-come, first-served except for group sites - call (403) 859-2224. The Waterton Lakes National Park Visitor Centre is open early May to early October. Brochures, bookstore and gift shop. Maps and publications are available for sale. Rangers are present to answer questions, issue backpacking permits, provide emergency assistance, etc. The Goat Haunt Ranger Station is open during the summer and provides maps, brochures, and interpretive programs. All services available at Waterton townsite.